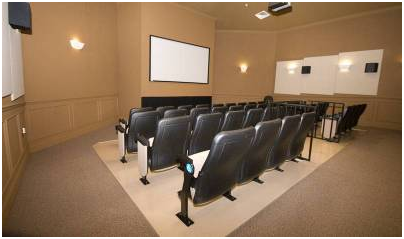 The movie theater is another very popular venue at Windsor Hills Community. We offer four show times and the guests decide on the movie selection. Requesting your selection is very easy, arrive at the visitor center and peruse through the catalogue of selections, there are over 800. 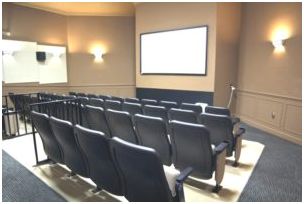 Choose a convenient time for the movie, there is 40 seats…room for everyone! come on down and cool off! Based on the availability, you may be required to reserve the following day. TIP “ I found out that if I visit the visitor center exactly at 9am, I can usually reserve my movie for the 1pm or 10am showing” Olivia, age 16 Annual Guest. 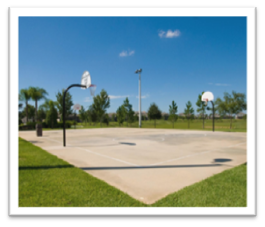 At Windsor Hills, the Recreation Park is open from 8am to 10pm. 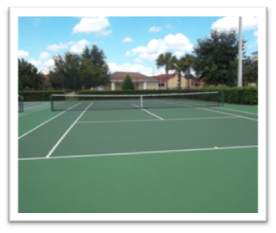 A range of activities are available for you and your guests including volleyball, basketball, tennis, and a putting green. Also at the recreation park are charcoal grills. Right next to the park is an oversized parking area used for oversized vehicles and overflow parking. Sporting equipment is available to rent at the Welcome Center for a fee and a refundable cash deposit.